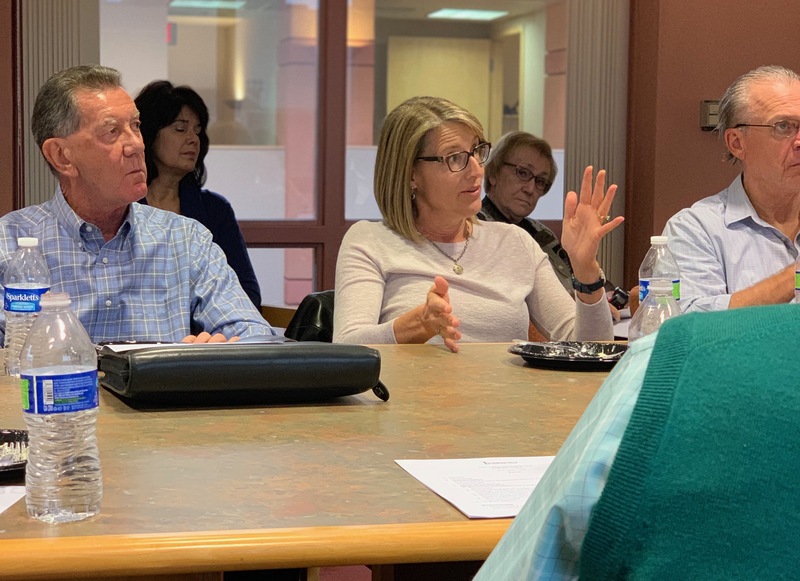 Growth, development and advancing the Town’s strategic plan were all topics at the Chamber’s monthly public policy meeting. Scott Cooper, Economic Development Director from the Town of Fountain Hills, presented and is continuously educating people about why it’s critical that we target industries that will be successful in Fountain Hills. It’s really all about demographics and proximity to resources, workforce and customers. We’re never going to have a Trader Joe’s in Fountain Hills. They require a customer based of 150,000 people within a 5 mile radius. It’s simply a formula that Fountain Hills will never achieve–or at least in any of our lifetimes. At 24,000 people that would mean adding 125,000 people to the area. However, the Town is targeting key industries that can grow within our community and will provide needed services. Again, this is based on research, data and demographics. Those industries are finance & insurance, healthcare, professional & technology and higher education. Instead of attempting to recruit companies based on what a few vocal residents suggest, the Town has carefully developed a plan that identifies gaps in our economy and sectors with opportunities to grow. This information, through the assistance of a national research and analytics firm, allows Town leaders, and most importantly our economic development director, to make strategic decisions based on current facts. For example, if Fountain Hills has a healthcare deficiency and there are 20 healthcare companies within the United States that are looking to expand into a market with our demographics, then it’s worth the time to pursue some of all of those companies. Even adding just one new business, in the right sector, may fill the deficiency in our local market. Some economic development is out of the public eye but still contributes to the Town’s tax base, retail shopping and sales tax. The Mayo Clinic has a 50 person office which houses IT and administration services. Vitargo corporate headquarters has added 2 jobs. FTS Watch Group will add 30 new jobs in year 1 and make a $500,000 capital investment. One of the newest companies is Med To You which will be opening in the Medical Plaza on Palisades. This healthcare organization will employ about 10 people in their office and on-the-road making house calls. Remember when doctors used to come to you? While these numbers may not seem large, they are significant relative to the size of our Town. When 50 new employees come to work in a community they typically buy lunch, gas up their cars, stop at the grocery store. Sometimes they use the local dry cleaner, get haircuts, buy flowers at the florist and so on. To sum it all up over 190 new jobs created were created in 2018 and over 150 are in the pipeline. The Town has benefitted from a nearly $4M Capital Investment. There is over $200M in the pipeline but it does include the Park Place and CopperWynd expansion projects.